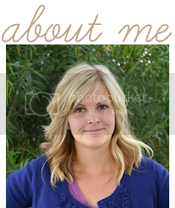 I am so happy to introduce you to some new Sparkle Power sponsors! Paula Kathleen's Cutie Pants shop has lots of adorable goodies for both baby & momma including onesies, baby pants, flower pins & mama dresses. 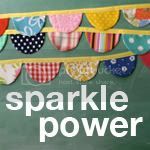 Through Saturday, May 22nd, receive a 20% discount when you mention "Sparkle Power" in the message to seller section at checkout. V and Co. is the place to go for affordable pdf patterns & kits for really cute projects, including pillows, quilts, fabric bracelets, skirts & bags. Through Saturday, May 22nd, receive a 10% discount when you mention "Sparkle" with your order. Just Be Jewelry offers really cute & fun jewelry including the popular & adorable grape soda bottlecap pin inspired by the Disney movie UP. They specialize in custom hand stamped jewelry, which make them a great place to shop for really sweet gifts. Through Saturday, May 22nd, receive a 20% discount on any custom order when you mention "Sparkle Power" in the message to seller section at checkout.